Bethlehem All Day; Great Place to be During Christmas and New Year! 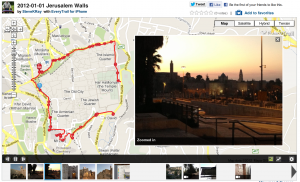 To see my early morning walk around the walls of the Old City of Jerusalem along with video, pictures and interactive map, click HERE or click on the map to the right. Great day, all day, in Bethlehem. Visited the largest Olive Wood store, heard the Our Father in the language of our Lord, touched the place Jesus was born, learned about the Church of Nativity and more in the morning. We ate falafel and schwarma for lunch. Mass in a cave in Shepherds Field where the angels announced the good news of Jesus’ birth to shepherds. We then visited the Carmelite monastery and wearing the robe of the Blessed Miriam of Jesus Crucified who is a local Arab saint. We prayed in front of her relics. Then for a dinner of the passover lamb along with fun Arabic dancing. Evening was blessed too with a time of reflection and free time.